There are few memoirs available of German Panzer crews that focus on the climactic last 12 months of the war on the Eastern Front, 1944-45. What makes Bruno Friesen's account virtually unique is his family background: his parents came from a German-speaking Mennonite community in Ukraine, and were to all intents and purposes culturally German. To make matters even more complex, in 1924 his parents left the Ukraine for Canada, where Bruno was born. In March 1939 he and his brother Oscar found themselves on a ship bound for Bremerhaven in Germany. He barely spoke German, and had never been to Germany, nevertheless his father envisaged that a better life awaited them in the Third Reich. Needless to say, Bruno became caught up in the Second World War, and in 1942 was drafted into the Wehrmacht. The author provides a full account of his family background, and how, through these unusual circumstances, he found himself a Canadian-born German soldier. 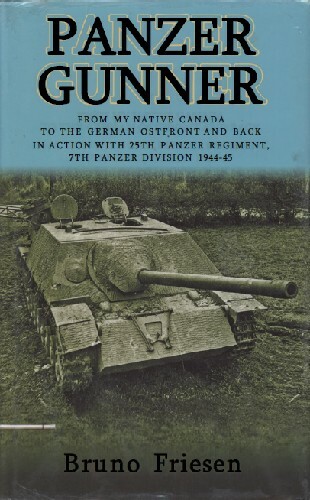 The bulk of the book is a detailed account of the author's training, and his subsequent service with 25th Panzer Regiment, part of 7th Panzer Division. 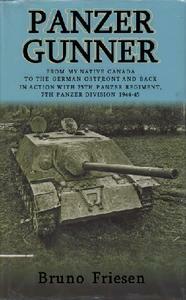 As the title suggests, Bruno Friesen served as a gunner aboard, initially, Panzer IVs, before crewing the lesser-known Jagdpanzer IV tank hunter. The author provides a fantastic amount of information about these two vehicles, and how the crews actually fought in battle with them. This kind of 'hands-on' detail has almost never been available before, particularly such extensive information concerning the characteristics and combat performance of the Jagdpanzer IV. Apart from providing a large fund of information about specific German tanks and their combat performance, the author writes in great detail about the combat the experienced on the Eastern Front, including tank battles in Rumania, spring 1944, Lithuania in the summer of 1944, and West Prussia during early 1945. If one wants to know how German tank crews fought the Soviets in the last year of the war, then this book provides an outstanding account, containing material simply not found elsewhere. The author closes his account by reflecting on his post-war efforts to return to Canada, which eventually succeeded in 1950, and his subsequent life there. This book is not just a critique of armoured fighting vehicles and tank warfare, it is above all a very human story, told in a lively, conversational and fluid manner, and is a remarkable contribution to the literature of the Second World War.